Demonstrators converge on Ferguson Police Dept. headquarters. FERGUSON, Mo. (FinalCall.com) - Nearly seven months since the death of 18-year-old Michael Brown Jr., the small St. Louis suburb of Ferguson still wrestles with many unanswered questions. Is the movement over? Was the protesting across the country all in vain? What’s on the horizon for the little town of approximately 22,000 residents, 67 percent of whom are Black? And do Black lives really matter? What is apparent is emotions and tensions still run high. Recently, over 250 protesters filled a meeting at the aldermanic chamber at St. Louis City Hall to voice concerns on a proposed independent police review board called the Civilian Oversight Board for the city. The Jan. 28 meeting came to an abrupt close when Jeff Roorda, business manager and spokesperson for the St. Louis City Police union yelled at moderator, Alderman Terry Kennedy for failing to “restore order” when protesters interrupted. Mr. Roorda then rushed towards Mr. Kennedy when he encountered Cachet Currie, a Black woman, in the aisle leaving the meeting. Mr. Roorda grabbed and pushed the woman down to get her out the way resulting in a scratch on her forehead. Ms. Currie is reportedly filing charges. Mr. Roorda was observed wearing an “I am Darren Wilson” wrist band to the meeting. The proposed board would have the authority to investigate allegations of police misconduct, research and assess police policies, operations and procedures. It would inspect complaints against members of the police department involving excessive use of force, abuse of authority, sexual harassment and assault, discourtesy, racial profiling, or use of offensive language, including, but not limited to, slurs relating to race, ethnicity, religion, gender, sexual orientation, gender identity, immigrant status and disability. Reports are surfacing that the federal investigation of former Ferguson police officer Darren Wilson will not result in charges he violated Michael Brown Jr.’s civil rights when he shot and killed the teen. 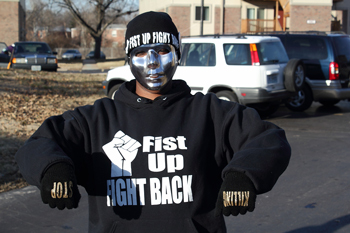 Marchers continue anti-police misconduct marches in Ferguson, Mo. The Justice Department report has not been completed, and Attorney General Eric Holder will make the final decision whether to press federal civil rights charges against Mr. Wilson. But activists won’t quit pressing for change, despite the outcome in Ferguson and other cities. Community groups and individuals are still organizing and demanding accountability from political and law enforcement leadership. 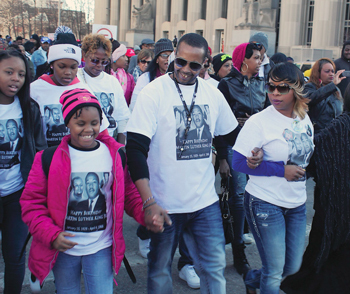 Many meetings and forums took place during the weekend of the Dr. Martin Luther King Jr. Holiday. “The movement is not over, we are not going to settle with the way things have always been. We still have more to do and we didn’t do a good job. Because nothing has changed, we haven’t gotten any of these police officers arrested for misusing their authority; we haven’t gotten any policies changed, the system of preying on poor people are still in effect, police officers are still allowed to do what the hell they want in the community and nothing is done anything yet,” said Dauud Amun Royal, co-chair of the St. Louis-based Center of Hope and Peace. “So for people to be slapping each other on the back and giving awards as if something meaningful has been done is an insult to the brother who got killed. That’s why we can go on T.V. and jump up and down like we’ve done since the 60s. And it means nothing because we don’t follow through,” continued Mr. Royal who was attending an event honoring Dr. Martin Luther King Jr. There is much more work to do and “we are not finished,” he said. Residents and activists vow to fight on for justice and change. The Charles Hamilton Houston Institute for Racial Justice hosted an event at Harvard Law School Jan. 17 to discuss racial profiling of Blacks and injustices in the legal system and formulate solutions. Participants from across the country gathered for open dialogue with law enforcement representatives, politicians and protestors from various cities. Ferguson 1000 Jobs co-founders St. Louis businessman Dave Spence and economist and investment advisor Dr. Lance McCarthy, Ferguson Police Chief Thomas Jackson, Ferguson Mayor James Knowles III and Paul Muhammad founder of the St. Louis Peace Keepers participated. 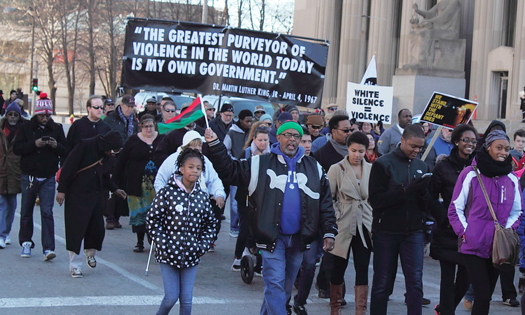 The event was filled with moments of anger and tension toward Ferguson officials. “I cannot quit or resign as chief in the middle of this, because I must have a chance to fix what’s wrong, that’s my responsibility and no one else can do it but me,” said Chief Jackson to The Final Call when asked about comments during the forum calling for him to resign. The movement is far from over and diversity training is one of the keys to moving forward but it will be a challenge, Mr. Muhammad told The Final Call. “But if the police departments are willing to allow those of us who are out in the community with the people, we can become the bridge between the police and the community. This would at least start the healing process and build a level of trust between the two,” he added. Police must first engage and get involved in the community and build relationships with the people to serve and protect, said Mr. Muhammad. He also recommended police become more actively engaged in schools, community centers and get to know people on a more human level to develop trust. On Jan. 18 Missouri Representative William Lacy Clay Jr. and members of the Congressional Black Caucus were at the Wellspring United Methodist Church in Ferguson to speak with the community. “We need to be outraged when local law enforcement and the justice system repeatedly allow young, unarmed Black men to encounter police and then wind up dead with no consequences,” said Rep. Clay. Dr. Leah Gunning Francis, an associate dean at the Eden Theological Seminary in St. Louis, insisted that society needed to regard the lives of Black men to be as important as those of White men. We have to restore the humanity of young Black men, she said. “We are going nowhere. We have several actions in place to take us from the selfishness thought process and bring it back to the village mindset. We are focusing on awareness, the community, education and the government. We have plans to raise the level of thinking first of the people then we can help sustain the community,” said Jeremy Rhone of the community group Mighty 13 of Ferguson. Before the non-indictment of Mr. Wilson many groups had hopes of justice to counteract issues that run deep in the city but the unrest increased locally and nationally, said Mr. Spence. 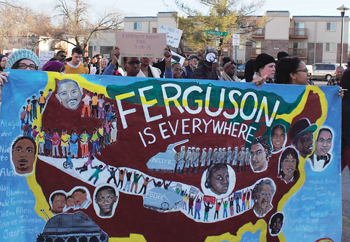 His group, Ferguson 1000 Jobs unveiled a comprehensive plan to address the issues. “We have been convening meetings with leaders for the last four months and understand there is apathy. People are tired of hearing lip service, hence we developed our views that were delivered as such from a wide variety of leaders in the community,” said Mr. Spence. Faith-based, corporate, community and youth leaders gave their opinions on what it would take to help get Ferguson back on track. The discussions have resulted in what’s been dubbed “Wish List for Ferguson.” It includes housing development, youth education and scholarships. Mr. Spence believes the “Wish List” will prompt more dialogue among all St. Louis region stakeholders, leading to action. Ferguson 1000 Jobs also aims to bring together some of the area’s largest employers to give St. Louis county residents job training, business development, and employment opportunities. “We are moving towards the poor people’s campaign. You are not going to see us just running out in the street to get tear gassed for freedom. We have to make everyday life a protest. We’ve had demands for six months and not one of our demands were met. None of them!” said youth activist Tory Russell of Hands Up United. He criticized President Barack Obama for not coming to Ferguson like former President Bush went to New Orleans after Hurricane Katrina. “Here’s the same man that wanted us to vote but he couldn’t come see the people when they were hurting the most. Then the worst was that we thought there was enough to get a civil rights charge. Not just local but nationally, there was cases that were clearly violations but that didn’t matter. That hurts when you have Black officials in high positions of politics but they can’t do nothing for their people,” said Mr. Russell. “In the 2016 election we will make the question does Black Lives Matter as part of the ballot and they will have to answer that question,” vowed Mr. Russell.